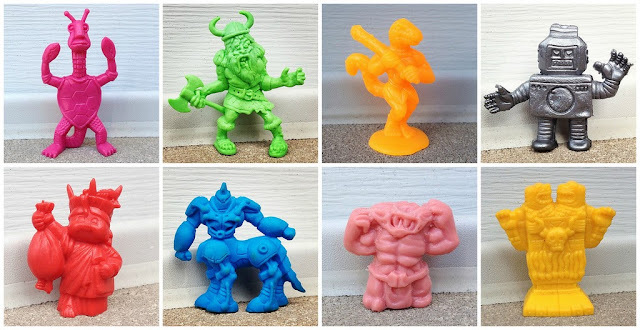 What do you think of these mono minis? Hey I recently acquired a pink version of the robot centaur figure pictured above, and I never knew what it was from. I am not familiar with the Panzer World Galient keshi line you have it listed as...do you know where I can find more info about these? Your collection is phenomenal...so much fun to look through! Thanks for checking out the site and for your comment! Unfortunately, I don't know of anywhere where you can find more info about Galient keshi. I'd be interesting in finding that, too. It took me a long time just to find out that's what they were. So I just realized that my figure is slightly different than yours..the head and chest are different and it is pointed the other direction. So that makes at least 3 different sculpts. I know this is likely a long shot as well but do you have any idea price wise on these? Even just a relative figure based on similar rare finds? I have found someone who might have some for sale, though he knows nothing about them...was just a random find on my part, and I just don't want to over pay or give him too low an offer. I also was curious if yours are more soft rubber keshi material or more of the Muscle type rubbery plastic? Mine is more Muscle style, but I think his are more keshi style. Wish I could find more info on these toys! Oh btw this is dixiebull on LRG's too, if you ever wanna discuss these or other toys! Hey Chris, I honestly haven't seen enough of them around to even estimate a price. I think I got mine randomly in a lot. Mine are made of soft keshi rubber. Maybe your firmer ones are bootlegs? And I wasn't aware you were dixiebull! Of course, always up for talking toys so feel free to message me on LRG as well.